The Royal Opera has announced the world premiere of George Benjamin’s new opera, Lessons in Love and Violence, which will be presented in May 2018. Inspired by Elizabethan drama, this new opera considers what space, if any, exists for love and human affection inside the dangerous machinery of power. The story centres around a king, compelled to choose between love and political hard-headedness. His decisions allow his country to slide into civil war, and set his own wife and son against him. When his son in turn is given bruising lessons in realpolitik, he performs ― albeit with the object of restoring peace ― a terrifying act of violence in front of his mother. George Benjamin’s third opera follows the very successful model of his second opera Written on Skin, with six partners from five different countries coming together with The Royal Opera to commission this new work. Kasper Holten, Director of Opera, for The Royal Opera said: ‘I remember sitting in Aix-en-Provence for the first night of Written on Skin and feeling that everyone present was at once deeply moved and aware that something very special had just happened. And in a time where quality and courage are so often under pressure, it has been astonishing to see these virtues triumph as this masterpiece has travelled the world with a speed unparalleled in modern operatic history. 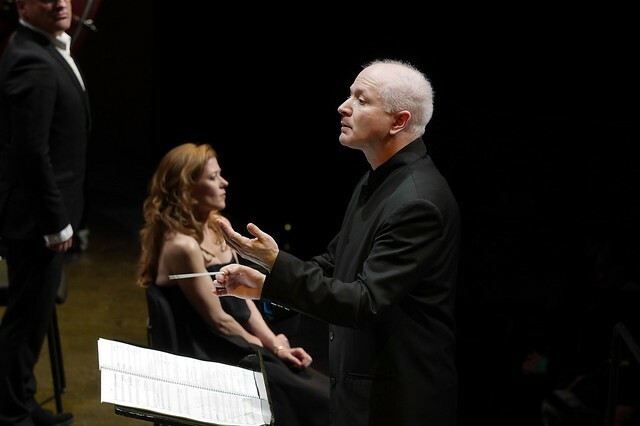 As with Written on Skin, George Benjamin will conduct all performances at the Royal Opera House. The work will be directed by Katie Mitchell, with designs by Vicki Mortimer. The cast will feature French baritone Stéphane Degout, Canadian soprano Barbara Hannigan, British tenor Peter Hoare, Hungarian-Romanian baritone Gyula Orendt, British tenor Samuel Boden, British soprano Jennifer France, Icelandic bass-baritone Andri Björn Róbertsson, and Hungarian-Canadian mezzo-soprano Krisztina Szabó. Lessons in Love and Violence is co-commissioned and co-produced with Dutch National Opera (July 2018), Hamburg State Opera (April 2019), Opéra de Lyon (May 2019), Lyric Opera of Chicago (2020/21 Season), Gran Teatre del Liceu, Barcelona (March 2021) and Teatro Real, Madrid (April/May 2021). With thanks to the generous philanthropic support from the Monument Trust. An exciting prospect and a wonderful cast! So exited and looking forward. A wonderful cast.